Ever been to Canal Street Coffee in Fremont? So Canal Street Coffee is the place you should go if you need a good place to get some good food with a great view. We all know that coffee is on another level in Seattle. Everyone drinks coffee and there are coffee shops on nearly every block. Of course you've got the more well-known places like Starbucks and Seattle's Best, but what people don't realize is that there are a million other coffee shops all over the area. Now before I go any further, I have to add a disclaimer here, and that is that neither my wife nor I drink coffee. I know, I know, we love Seattle and we don't drink coffee. But, contrary to popular belief, coffee isn't the only thing you can get at coffee shops, and Canal Coffee in Fremont is proof to that. 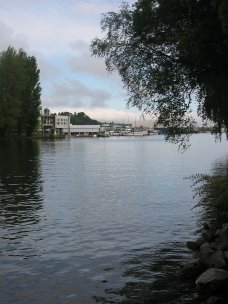 They have some great pastries you can get and there is an outdoor eating area (deck) that has a great view of the Lake Washington Ship Canal. 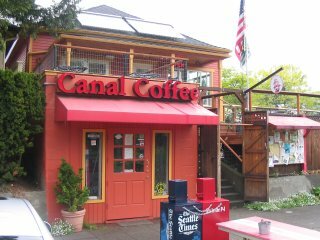 Canal Coffee is located on the Burke-Gilman trail at 102 NW Canal St. and they have free wi-fi there everyday, which makes it a great place to grab a bite and get some work done in a great atmosphere. The only thing that is lacking a little is the indoor seating area, which is rather small, but when the weather is cooperating, the outdoor deck is a great place to catch a slight breeze and relax while watching some ships come down the canal. Back from Canal Street Coffee.